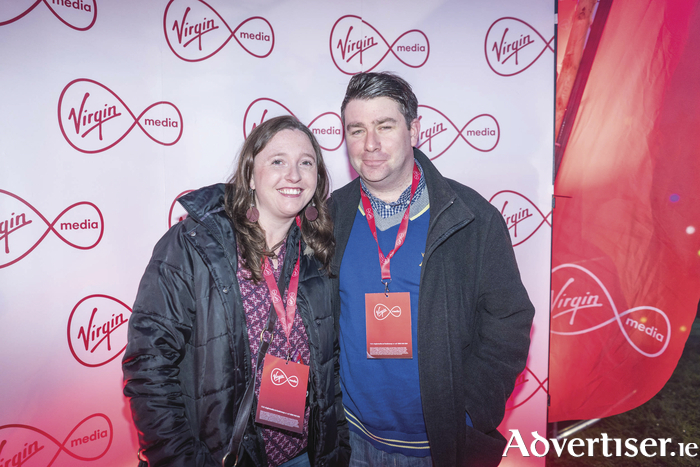 Ann Marie Kearns and Chris Rippingale from Castlebar at the Virgin Media Full Stream Outdoor Cinema in Castlebar Military Barracks to see Quentin Tarantino's Pulp Fiction. Photo: Keith Heneghan/Phocus. The BRI support/peer group meeting is for people who have experienced a brain injury/trauma over the years, such as a stroke, aneurysm, or hemorrhage, as well as their carers, friends, and family. The meeting offers support, information on assistance in the community, and gives people a chance to discuss their experiences with one another in a confidential setting. BRI runs a virtual meeting (telephone service ) for those who are unable to attend meetings due to travel restrictions. The next meeting will be held in Le Cheile, Family Resource Centre, Tucker Street, Castlebar, from 7pm to 8pm on Thursday, October 5. For more information contact (087 ) 1685554. Rocks and Roses Cancer Survivors Choir is holding a concert in the Castlebar Tennis Club on Wednesday, October 11, at 8pm. Special guests are Atlantic Rhythm. Tickets are €10 and are available at Gavins, Spencer Street, Castlebar, or by calling (087 ) 2250704. Archaeologist Seamus Sheedy will be giving a talk in the Charlestown Arts Centre on Thursday, October 5, on heritage, landscape, and archaeological finds in the area and the tools used in excavating a site. There will be a small charge of €5 for the talk. For more information call (094 ) 9255934. Rebecca Crowell's exhibition Still/Moving in The Ballinglen Gallery, Main Street, Ballycastle, opens tomorrow, September 30, and will run until Monday, October 23. The official opening will take place tomorrow at 8pm. For more information call (096 ) 43184 or email [email protected]. Go along to this free weekly, timed 5k run, jog, or walk at Clare Lake every Saturday morning at 9.30am. Register at www.parkrun.ie/register then print your barcode and bring it along with you on the day. For more information find Claremorris Parkrun on Facebook. Exercise classes for women take place every Wednesday morning from 11am to 12 noon in the Ballina Family Resource Centre, Ardnaree. The group enjoys a chat and catch-up over a cup of tea/coffee after the exercise. There is a loyalty scheme in place. New members welcome. Ring (096 ) 75573 for more information. The AGM of the Cong Moytura Heritage Society will take place at 8pm on Wednesday, October 11, in the Crossroads Community Centre, Cong. Would you like to be involved in the running of the society? Go along and join in. A one day inner transformation workshop will be held at Little Acorns Childrens Centre, Brickens, on Saturday October 21 from 10am to 4pm. The theme is 'Healing Through Self Acceptance and Journeying With Self Compassion'. This workshop focuses on meeting yourself in a more loving way to enhance self esteem and self worth. This is open to men and women. For more details contact (085 ) 7297451. Irish Rural Link is offering a free computer course called Getting Citizens Online in the Erris area and north Mayo. It is designed for beginners to help you feel comfortable using a computer. It is an introduction to the Internet, shopping online, emails, and basic Microsoft Word processing. The course takes place over two hours each week for five weeks. To book a place on this course contact Josephine on (086 ) 0897789. Kilmovee's pop-up restaurant is back on Saturday, September 30, in the Thatch Cottage. It costs €25 for three courses and is bring your own bottle. A €10 per person deposit is required. Booking is essential. Ring the community centre on (094 ) 9649484 or email [email protected] for reservations. Check out the Facebook page for menu. The parent and toddler group takes place every Thursday from 10.30am to 12 noon in Ballina Family Resource Centre. This group is open to all parents, grandparents, and childminders to come along with their child/children and meet new people over a cuppa and a chat. Various activities take place and new members are always welcome. Ring (096 ) 75573 for more information. The group meets in the centre every Friday from 2pm to 4pm. This is a drop-in facility and open to all older people in the community – go along, meet new people, make new friends. The Kiltane Rural Social Scheme is currently recruiting new participants in the parish. If you have a herd/flock/fish number or you have access to a number from your father, mother, brother, or sister and are in receipt of a means tested Social Welfare payment you may be eligible. Participants of the rural social scheme are involved in a wide range of activities which enrich the Kiltane community. For more information contact Brid at (086 ) 3488846. South West Mayo Development Company outreach clinic takes place every Monday from 10am to 1pm in Claremorris Family Resource Centre. Are you thinking of setting up your own business? Do you need advice with a business plan? Breda Murray (South West Mayo Development Company ) will be available to help and assist you with any queries you may have. Contact the centre on (094 ) 9377838 to make an appointment. Sancta Maria College Parents’ Association is holding a bingo fundraiser in Louisburgh Town Hall on Sunday, October 1, from 7.30pm to 9pm. Go along for a great fun filled night. All money raised goes towards services/equipment for the students. Creative writing classes for children (8 to 12 years ) will recommence on Thursday, October 5, in the Parish Centre, Chapel Street, Castlebar from 4pm to 5pm. This term will consist of eight weeks and will cost €70. Booking is essential, contact (086 ) 860-2131 for further details. Adult creative writing classes will also start on Thursday, October 5, from 2.45pm to 3.45pm. Booking is also essential. For further details contact (086 ) 8602131. Ballina Stephenites Squash Club, in association with Irish Squash, is hosting an afternoon of squash for ladies aged 18+ on Saturday, October 7, from 3pm in the Ballina Stephenites Squash Club. This is a free event and an invitation is extended to current squash players and any women who would like to try squash. All levels of players will be catered for. There will be coaching and skills session with the opportunity to try out some of these new skills against other players. Squash can be taken up at any time with club competitions catering for all levels. Refreshments will be provided. For further information and to register your interest, see www.ballinasquash.ie or contact Kathryn on (086 ) 3176105. Computer classes for beginners will resume on Tuesday, October 17, between 5.30pm and 6.30pm in Charlestown Library. For further information contact the library at (094 ) 9255934. Balla bingo continues every Monday night at 8.30pm. Are you interested in web design, mindfulness, or a Irish course? If so call Sheona or Tony on (094 ) 9365846 for more information on upcoming courses. UniSlim takes place in the Resource Centre every Thursday evening at 6pm. New members are always welcome, contact Sharon on (087 ) 7917851. Yogalates continues on Wednesday evenings from 7.30pm to 8.30pm, contact Pat on (087 ) 2617309. Pilates continues every Thursday from 8pm to 9pm, contact Natalie on (087 ) 2340695. Bible study will be resuming this month, contact Anne on (086 ) 8489244. Balla B Fit takes place on Tuesday and Thursday mornings from 9.30am to 10.30am, contact Lorna on (089 ) 6174417. It is proposed to run a parent and toddler group in the Community Resource Centre starting this September. If you are interested in taking part contact Sheona at the community centre. Phone (094 ) 9365846 or (087 ) 1850860. If you would like an item included in our Community Diary, please send in the information to [email protected] by 5pm on the Monday before publication.